When Ben Farinazzo arrived at his first-ever powerlifting competition at the Invictus Games he was overwhelmed by the stadium’s narrow corridors and the shattering noise of the crowd. He felt bowled over by the adrenaline pumping through his body and was terrified of overstimulation. 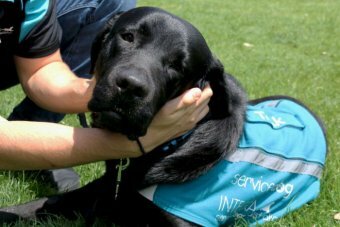 Enter service dog Tank, a 15-month-old Labrador, who was called upon to give the former Australian soldier much-needed comfort. Despite officials’ requests for no dogs on the field of play, Tank was desperate to settle Farinazzo and refused to be left behind, so he walked out on to the field with him to the crowd’s surprise. 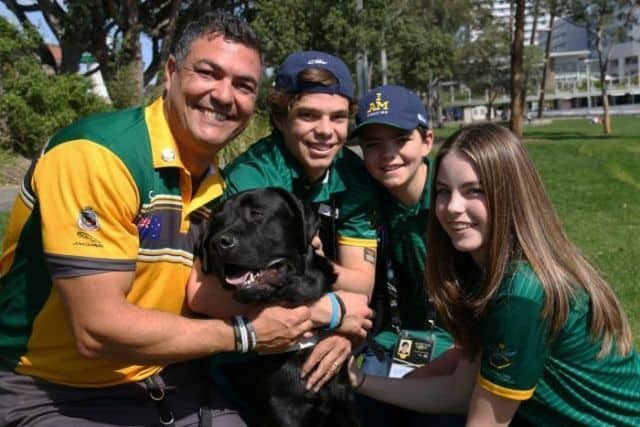 Tank is one of 12 service dogs working around Sydney Olympic Park during the Invictus Games, offering support to competitors as they grapple with a busy and complex environment. “Trying to listen to instructions from the marshal with dozens of other international competitors was very challenging and overwhelming and I found myself shaking,” said Farinazzo, who achieved a personal best in the powerlifting. “But Tank had this remarkably calming feeling over me that was totally unexpected. 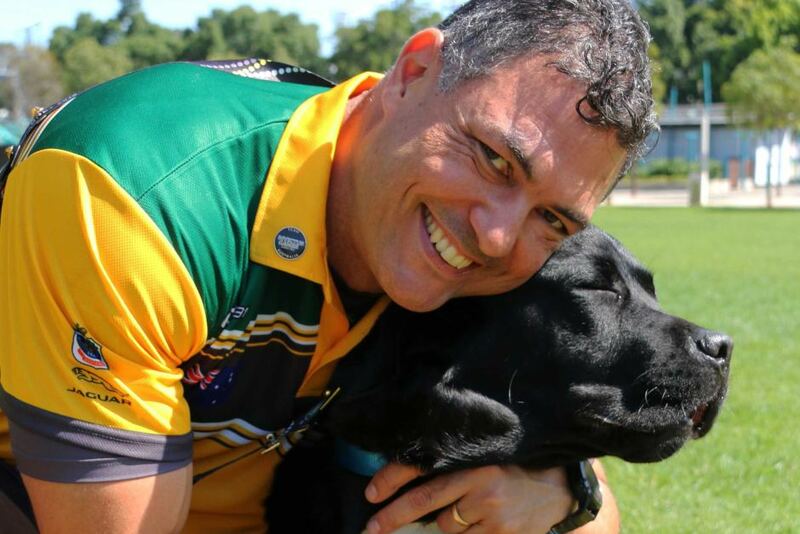 Farinazzo first met Tank in Canberra on World Mental Health Day earlier this month and was ecstatic when he ran into him again at Invictus. “He is a blessing,” he said. 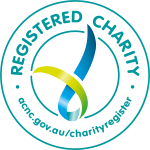 “For me, with my PTSD [post traumatic stress disorder], depression and anxiety, I find it hard to maintain mental balance while there’s a lot of white noise in the background, while I have to concentrate on instruction. This was made worse by the pressure of the world watching his first powerlifting competition. MJ Batek from Canada also sought support from assistance dogs this week as she competed in swimming, archery and wheelchair basketball. “After getting out of the pool I was exhausted, felt sick and overwhelmed by the noise, and I couldn’t hear the starting buzzer due to my tinnitus, which I didn’t expect,” she said. After this Batek, who suffers PTSD due to being sexually assaulted in the military, went to find Labrador Molly, who was working behind the scenes at the pool. 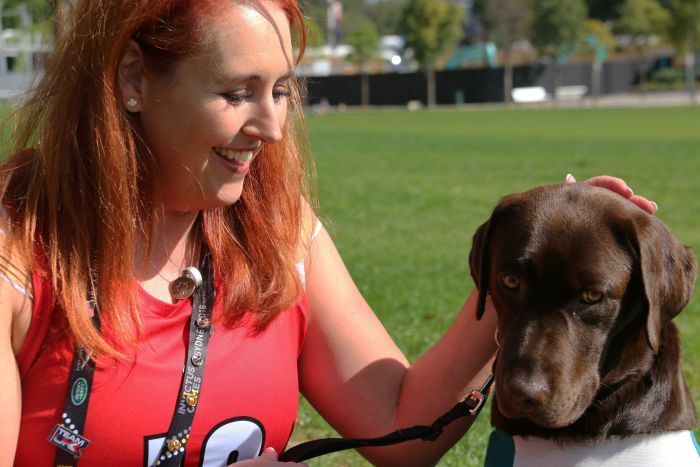 “I needed something — I don’t want to go to a counsellor, I don’t want to go to a teammate because they are about to compete — but I could come and hug one of the dogs,” she said.